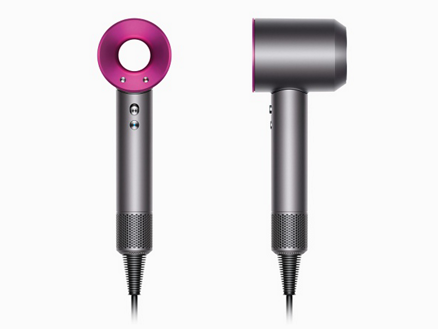 I’ve been eyeing the Dyson Supersonic hairdryer ever since it made its debut in September 2016, but truthfully, I could never justify spending that much money on a styling tool when I really don’t even blow-dry my hair all that much—and I was totally OK with it. However, I started to seriously consider taking the plunge a few months ago when my dog, Nugget, had an issue with the groomer we’ve been using since we got her. Here’s what happened… Nugget was outside in the groomer’s van (he comes to our house, isn’t that awesome?) and I was sitting in my office—then I started to hear her screaming (despite the fact she was in a vehicle with the ignition on and we were separated by rather thick hurricane glass windows). I immediately ran outside to see what the f*ck was going on, started banging on the door and the groomer stepped out with a sopping-wet Nugget in his arms. No, she wasn’t being tortured in any way or by any means—she was petrified of his industrial-strength hair dryer. At this point I decided to let her air-dry moving forward, but after a few significantly less-traumatic grooming experiences, she was a matted mess and had to get shaved down. That’s when the groomer told me she doesn’t have the type of hair/fur that can air-dry, so I was in a pickle, and the dog looked like a hot mess. This, my friends, is why I finally pulled the trigger and dropped $400 on a freaking blow-dryer. I did not take this purchase lightly, and I did my homework. I FaceTimed with my friend Beth who has a Dyson to see if it really was so much quieter than other blow-dryers, and the fact that we were able to talk normally with the Dyson whirring right there sold me. When it arrived the next week, I couldn’t wait to try it—and I have to say I’m really happy with it (although Nugget has her next grooming appointment next week so I’m still not sure if it’s going to do the trick for her or not).